“And suddenly” was probably the only way you were going to get this thing published. There been way too much tension. Sooo glad you made it and seemingly all in one piece. Way to go! Seriously, this is why it takes me two-four weeks to get properly back into writing at the end of completing a book. Because there’s just SO MUCH TO DO and it buries me so that I can’t breathe. At the moment I’m buried under library requests, sickness, and the need to update every one of my ebook files, plus a multitude of small nothings that add up to a huge something. Also, I have mad Impostor Syndrome at my work, like, 95% of the time. And, in my extremely inexpert opinion (but I have read, probably literally thousands or even tens of thousands books in my 30 years, so that has to count for something) you are a freaking master and if I could ever write like you, I would be beyond proud of myself and pleased. One likely worthless opinion that likely will be no comfort when anxiety rears but there it is anyway. I love that “Beyonce” is now a verb, and that she has made releasing things on the fly acceptable. I’d’ve done it this way anyway, but its nice to have legit precedence. And your opinion is in no way worthless. Thank you so much for the high compliments and encouragement. I will try to live up to them! Ok, I read it, I’m pretty sure I love it, but I have SO MANY feelings about it. Also, it seemed, to me, like a different voice for you and that genuinely threw me a bit! (Is that weird? That’s probably weird.) Not just the first person instead of 3rd (which I normally find terribly distracting but it didn’t distract me at ALL – perfection) but something more than that – something I’m not quite smart enough to put my finger on at the moment. A good something. Regardless. I loved it (though the bloodthirsty part of me would not have objected to seeing Tana have a bigger part in the ending, if you know what I mean). I don’t have an intelligent comment here, honestly, I’m scrambling. I just loved it. Hooray! It is a different voice! I’m absolutely thrilled that that comes across, because I slaved over that different voice. Basically, I took every linguistic principle I know and put it into practice: I stripped out passive structures, existentials, and experiencer-assigning verbs as much as possible and focused on agent-assigning verbs instead. I framed the narrative to be dynamic even when dynamic things weren’t necessarily happening, and I’ve agonized ever since over whether I did it right or not. Sorry if this is all a bunch of nerd-speak gobbledygook, but THANK YOU FOR NOTICING!!! Oh good lord, I have so much to learn. I wrote a weirdly long (for me) review on amazon after I commented – i don’t know if you read those (I wouldn’t/couldn’t) but I wanted to reiterate a specific part here. I loved most of all that Anjeni never lost herself in her power. When in a war, she struck a balance between respect for life and understanding the necessity of sacrifice that resonated with me. It took me a little bit to figure out how to write that, how to express the very deeply personal and validating feeling it gave me (and it’s got a whole other paragraph in the review explaining a bit further). But. I’m a vet, and so often the shows I watch and the movies I watch and the books I read show how virtuous the protagonist is by their refusal to kill unless literally no other option and that always bugged me and seemed irresponsible. Anyway, while processing it and writing that dumb review last night, I was near tears. I don’t cry about things *very* often and, short of a MC death, I can’t remember the last time I did while reading fantasy/YA. It just resonated with me that highly. Thank you for that. In general, just thank you for how you handled the war aspect of things. Edit ***Seemed irresponsible and cast a sort of passive judgment over people and decisions that weren’t really our own. People who were important to me and people who are important to me and even just… me. You put into words something I’ve felt for a long time, and beautifully so. 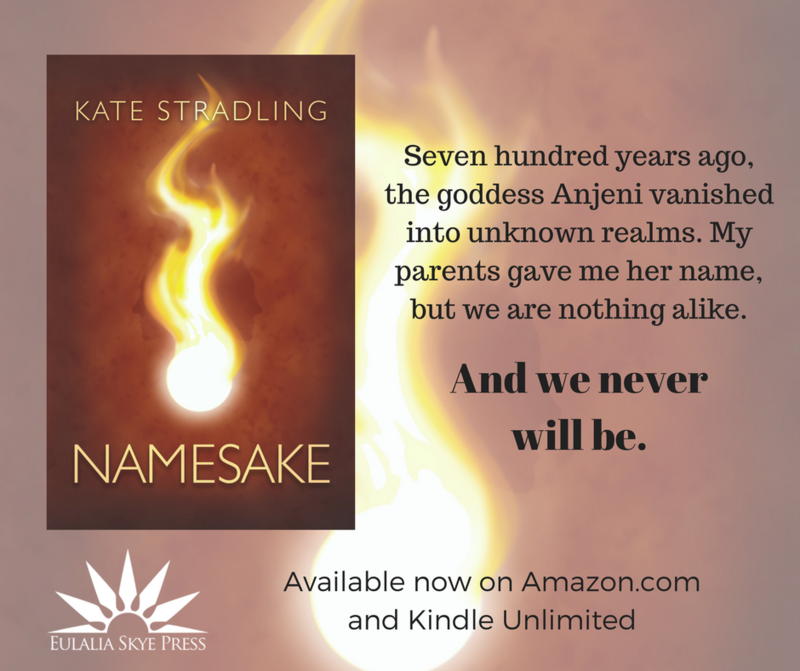 When I was writing Namesake, there was never a question of Anjeni pulling her punches. The “noble pacifist” trope (for lack of a better name) has its place, but the degree to which it shows up in books and movies and tv *is* irresponsible. It definitely would have been irresponsible in this story. Thank you for your service. I stand in awe of those who have volunteered their lives to protect the freedoms we all enjoy. I’m humbled by your response to this book, and so grateful that you shared your thoughts. Yes! This! I was so pleased when Dami was making sure all the enemy spark bearers were properly dead. The ‘noble pacifist’ does have it’s place, but oh my word, it’s the thing I hate about a lot of things I’d otherwise love–KDrama, I’m lookin’ at you! Because sometimes you NEED justice. Sometimes you NEED judgement and consequences and the awful responsibility of making sure that just deserts are administered, no matter how awful. Otherwise, were the ones who died worth nothing? I love a good redemption arc, but if there are never any consequences or judgements, what is the power of a redemption arc? Just found and read this book this morning all at once. I loved it. Loved it. I wanted more. I still want more. Anyway, even if there is never any more in this universe and style I am so glad you made it through and published it. Totally worth it. Ahhhh, thank you! I’m glad you enjoyed it! Thanks for your comment, and your encouragement. Again, so happy that you found Namesake worth your while.